There is a degree to which these three tend to happen simultaneously, but they define three distinct activities involved. On-site collection involves, first and foremost, interviews with local community informants. This provides insides views on the community, the land, the environment, and the history of the area, as well as stories of local events or legendary occurances. The researcher must also "walk the land" to gain a first-person sense of place, an intimacy with sights, sounds, and smells, in order to be able to effectively reflect a sense of place when editing and composing the web site. Some geographic reconnassance is also useful for framing the place in contemporary terms of relative location. Finally, extensive photography is performed to enable a strong visual presentation of this place. Bibliographic materials then supplement the oral material gathered, as necessary. This includes legends and other stories, proverbs and sayings, historical records and materials—especially those relating to changes in land ownership or use, and historical eyewitness accounts of the area, as available. Finally, some "western" style information is brought in to round out the science aspects in particular, and to provide a point of discussion between traditional and Western perspectives. Statistical and Demographic data, once again, provides greater detail on physical environmental phenomena (climate, population and so forth) that is usefulto supplement the oral records, as well as providing a demographic history of the area that relates to other changes in land, society and economy. Other Images are gathered as needed, and as available, to further the graphic presentation of information on the site. This can include historical photos, air photos, maps of all sorts (including those generated by Geographic Information Systems), and iconography for building a theme for the navigation structure. 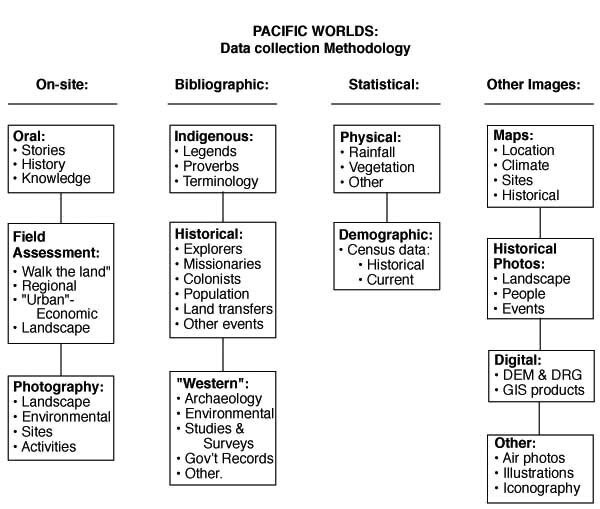 With this methodology, Pacific Worlds hopes to accomplish its mission goals. It is also our intention to help communities to adopt and modify our methodology to build their own websites.